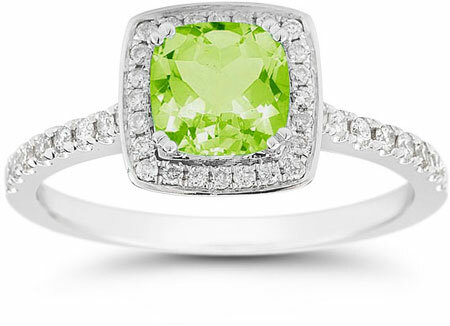 This Cushion-Cut Peridot Halo Ring somehow manages to be both fresh and timeless and to portray both personalities with flawless, eye-catching beauty. This elegant 14K white gold style will bring a touch of summer and sunlight to your look no matter when you wear it. The striking green gemstone that serves as the centerpiece of this chic halo ring captures the lushness of a field of grass after a soaking rain. 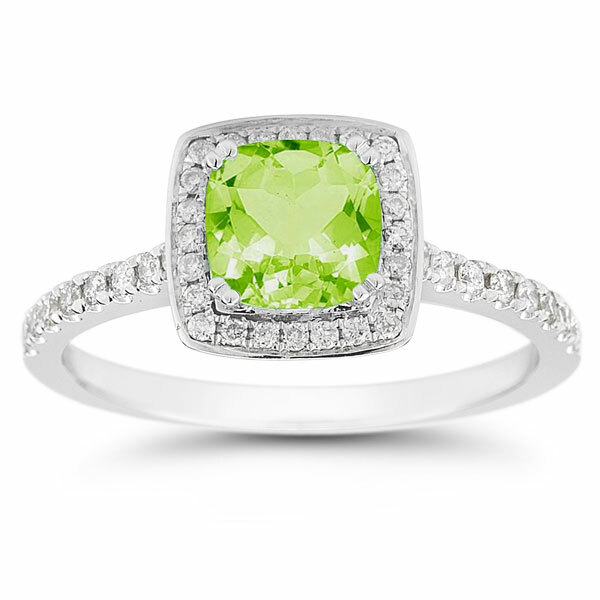 With just a hint of gold, this peridot seems to convey a sense of both life and sunshine. The cushion cut of this 6mm gem was popular in the 1800s; its gently curving sides and square shape give this ring a perpetually elegant personality that's a lovely match for its vibrant greenish-gold glimmer.